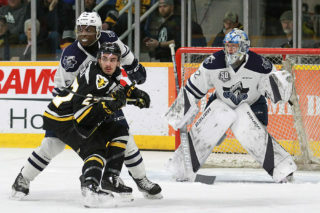 Round four of the Battle of Nova Scotia goes tonight as the Screaming Eagles visit the Scotiabank Centre and the Halifax Mooseheads. 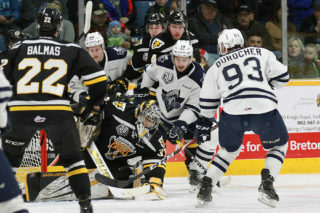 The Screaming Eagles will hope one trend continues as the road team has won all three meetings thus far in the season series. The Mooseheads won the first two meetings of the season but the Eagles spoiled the party for Halifax’s home opener 13 days ago, with a 5-2 victory in the capital city. 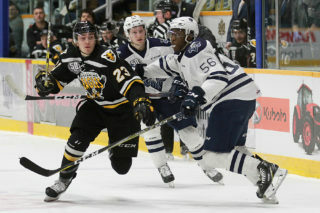 Cape Breton will be looking to push a winning streak to three games after winning the last half of a four game stand, concluding with a 4-1 win over Chicoutimi. The Eagles are tied for sixth in the Eastern Conference with a record of 10-9-1 (6-3-1 on the road). Halifax stands at 14-4-1 (1-1-1 on home ice), good for third in the conference. 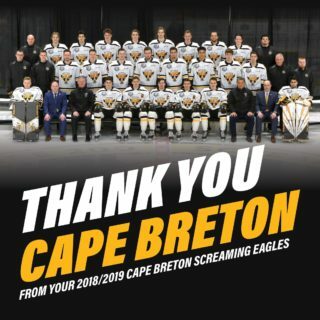 For the Screaming Eagles depth has been important as the last two games the club has lost a forward to injury, with Mitchell Balmas going down to injury on Sunday against Bathurst and Isiah Campbell leaving Wednesday against the Sags. Ian Smallwood has a point in all three games since moving up to play forward, and Shaun Miller has quietly accumulated five points over a four game point streak. Leon Gawanke has helped drive the offense from the backend with seven points over his last five contests. While both teams are capable of scoring, power play goals may be hard to come by this evening. Both clubs rank in the top three in the QMJHL in penalty killing- Halifax with an 86.5% efficiency and Cape Breton at 82.5%. Puck drop for tonight’s game is at 7 PM, and you can catch all the action on Eastlink Television, as well as on CJCB radio beginning with the pre-game show at 6:30 with Patrick McNeil on 1270 CJCB (or online at cjcbradio.com). Go Eagles Go!